I was browsing Jose José Fernandes' latest update in his discussion topic and found myself wondering what a kit-bash between an OV-10 Bronco and the V-22 Osprey would look like. Retain the booms but lose the engines. The booms could then be devoted to the landing gear and fuel plus whatever avionics that could not be accommodated in the fuselage proper. At the wing tips - mount the engines and rotor components from the V-22. The only thing that I can see at this point that could be a problem is the rotor blade clearance with the tail. Now I wish I had a 1/72nd scale Italeri V-22 Osprey kit in the stash to check fit with the Testors'/Italeri OV-10 Bronco. Well, since I now work for Bell, I can say that there were studies for an attack aircraft using Model 609 mechanicals and structure (I saw a rendering over a co-worker's desk). Meanwhile, I'm more actively involved with developments and projects on the V-22. A couple thoughts, since the V-22 is replacing the CH-46 in USMC service, how about a V-22 in three-tone green splinter camouflage replacing the equivalent V-107-II in Swedish service or an OD V-22 with hinomarus doing the same in Japanese service. Of course, if you're thinking bigger, there's always the Quad-Tilt-Rotor which could be modelled using a C-130 fuselage (alternatively, for grins, use an AN-12 fuselage to get the tailgunner position). Graeme Davidson did some nice profiles of the V-22 in various schemes for different nations. One of which was the JASDF and the other was for Sweden in the splinter camouflage. Since Graeme is not yet a member of this little group any of his work might still reside over on the other forum unless they suffered the recent purge in which case they are gone. I linked a number of screen shots that I had originally shared a long time ago on the other forum before going into exile and have since been dredged up to share here with the other members. A few of my tilt-rotor whifs for your enjoyment... (I hope). The Grumman OV-1H Mohawk II was the next logical step in the evolution of the reliable and flexible G-134 design. Featuring widened and shortened wings, it became the first operational tilt-rotor in the U.S. inventory when the Army took delivery of the first aircraft in June 1986. The G-134TR Mohawk II proved a valuable asset in difficult missions over Panama and Nicaragua, where the hostile environment made landing impossible to the original version. The Mohawk II was used for observation (OV-1H), as a rescue aircraft (HV-1H) and as an armed counter-insurgencency type (AV-1H). 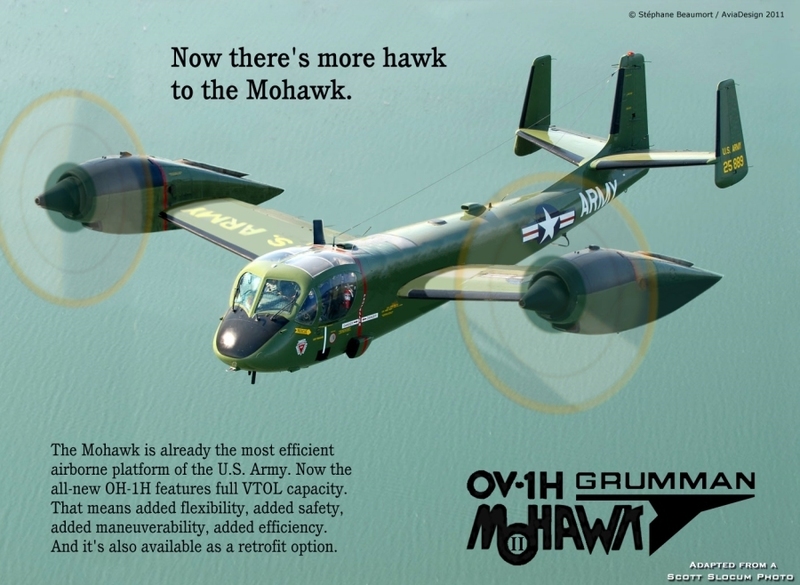 On top of the 110 new examples built by Grumman, most Mohawks remaining in the inventory were overhauled and brought up to "II" standard, bringing the total in operation up to 250. These versions, although externally similar to the new frames, presented a number of technical differences and were therefore designated with the use of the "J" suffix letter instead (OV-1J, HV-1J). There were no AV-1J conversions, as all 60 COIN aircraft were new from the factory. Finally, a small utility transport with deepened fuselage was produced in 12 examples (UV-1K). The last Mohawk II was retired from service in May 2003, making the G-134 family one of the most enduring designs in U.S. service. Some may remember my Vought-Sikorsky Shrike (then again you may not... lol). Well, anyway, here is another take on the LTV XC-142 concept, the LTV V-498 Bluebird (which derived its name from Vought's very first aircraft). 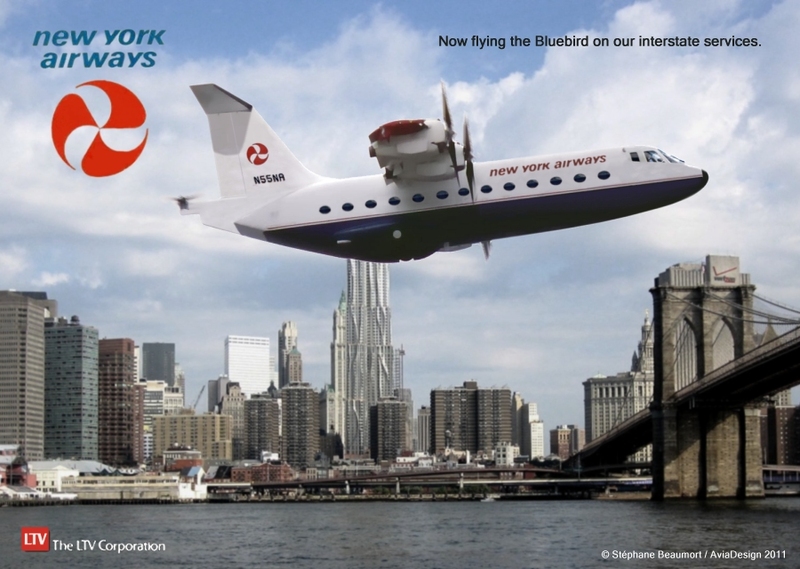 It was produced in small numbers for a few regional airlines in the U.S. and Canada, such as the now defunct New York Airways, seen here. What if Bell/Boeing's V-22 had not been the first operational VTOL? What if Boeing had teamed up with Learjet instead to offer an heir to the old X-19 concept and make it work as a liaison/VIP transport? 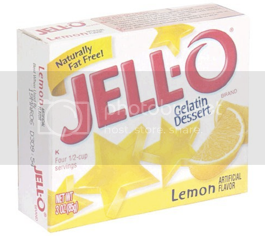 This is what the fake advertisement above is all about. And finally a tilt-duct... Not quite what this topic is about, but since someone included a tilt-duct above, I may as well add mine here. Contrary to popular belief, The V-22 Osprey is not the first joint effort by Bell and Boeing. 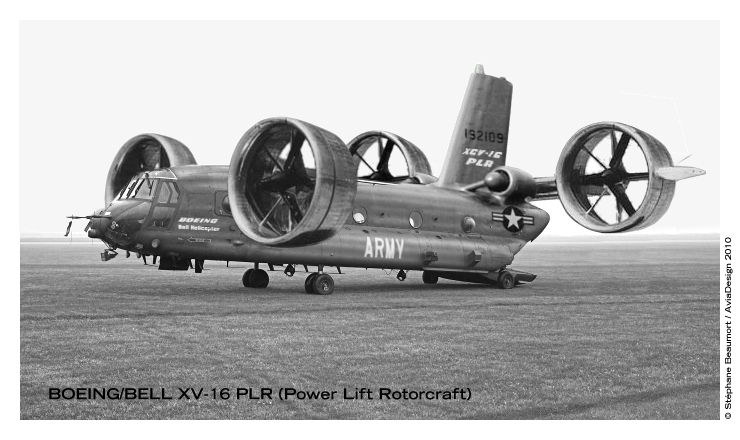 In 1976, Boeing Vertol teamed up with Bell's Helicopter Division on a proposal for the Army's PLR (Power Lift Rotorcraft) program. Designated XV-16A in the VTOL series, this clean-looking and able performer combined Boeing's experience with transport helicopters and Bell's expertise in VTOL, in this case capitalizing on the tilt-duct research that culminated in the highly successful X-22A prototype a decade before. 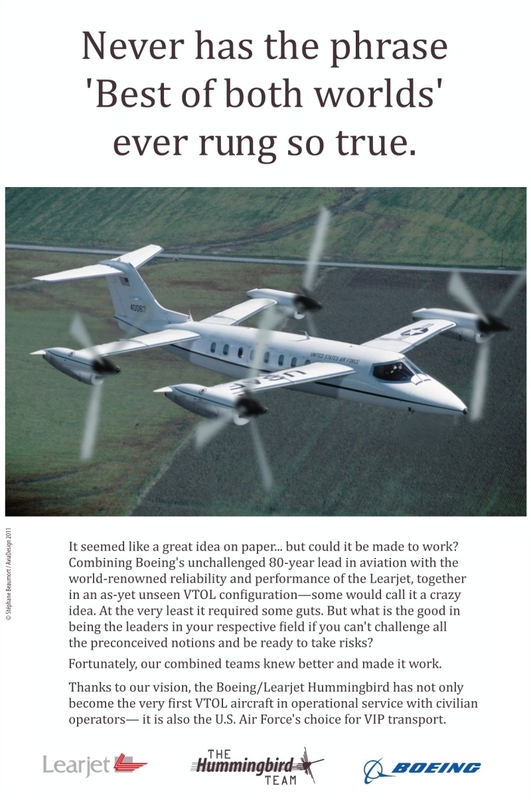 The PLR program was canceled despite a successful two-year evaluation phase because it was found that its advantages did not outweigh the 35% increase in costs from operating it instead of a conventional Chinook. This pic below came from the USMC website sometime ago. I've got a project started to do this but then realized I had gone in the wrong direction so I'm going to start again. I'm going elaborate on it though as I don't really think having the rear engines behind the front ones like this will be workable (in RW). Considering that all the engines are interconnected and have shafts running here, there, and everywhere, my idea will be to have two larger engines either side of the fin in an arrangement very similar to the CH-53 instead of the four in the wingtip pods. I've got the kits somewhere in the stash here (still don't have everything sorted out from after my return) to cross the XV-22 with the Dash 8 for a civil tiltrotor. 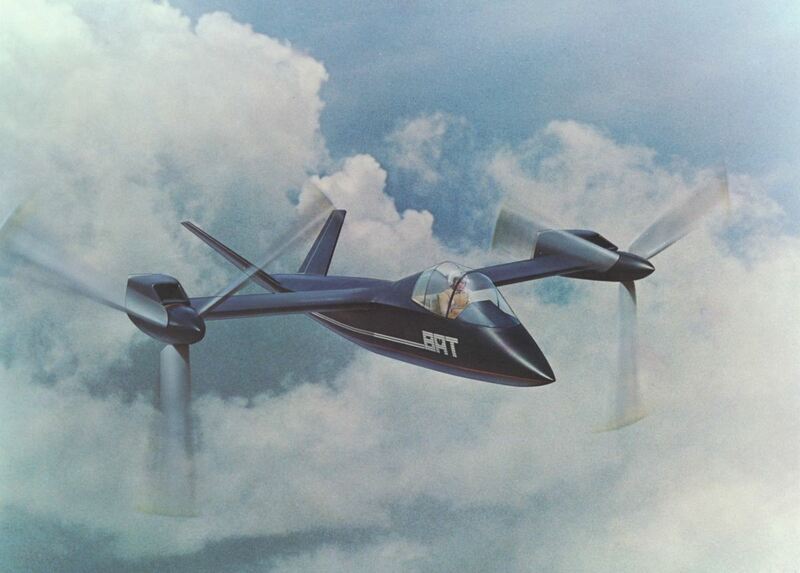 Is great bunch of tilt rotor/jet concepts. Thanks for posting - do like reviewing them. I have a tilt jet bash on the list to build. Thinking of doing it STOL using a 30 to 45 degree max tilt. I was browsing Jose Fern's latest update in his discussion topic and found myself wondering what a kit-bash between an OV-10 Bronco and the V-22 Osprey would look like. Retain the booms but lose the engines. The booms could then be devoted to the landing gear and fuel plus whatever avionics that could not be accommodated in the fuselage proper. At the wing tips - mount the engines and rotor components from the V-22. The only thing that I can see at this point that could be a problem is the rotor blade clearance with the tail. Now I wish I had a 1/72nd scale Italeri V-22 Osprey kit in the stash to check fit with the Testors'/Italeri OV-10 Bronco. You'd like want to do a scalarama with the nacelles from a 1/72 V-22 on a 1/48 OV-10. The OV-10's engines are rated at no more than 1000-1100 shp max while the the V-22's engines are rated at some 6000 shp. I could see replacing the OV-10's engines with fairings covering either extra fuel tankage or various equipment fits. Note that if you do this one, you need to also take the section of the V-22 wing immediately inboard of the engine as there's a lot going on there and some of the wing/engine fairing rotates with the engine nacelles. As much as I like the idea of "More Power" for the Bronco it would be a challenge to do so with the 48th scale V-22 parts since the blades would conflict in their arcs over the center of the fuselage. The smaller diameter rotors on the 72nd scale V-22 might work a bit better for what I have in mind. Just need to find the 1/72nd scale V-22 kit in order to do the check-fit. Don't forget that the V-22 is rather larger than the OV-10. That almost makes such a mixing necessary. I note that there is one 1/72 V-22 on eBay right now, but it's not cheap at all.